Scroll down to see the top not-for-profit colleges and universities in Delaware offering online degree programs. Wilmington University's nearly 100 online programs are available at both the undergraduate and graduate levels. The former has several dozen baccalaureate majors, minors, associate degrees and certificates ranging from health care to human resources to education. The lineup for the latter looks similar, with business, nursing, information systems technologies, homeland security and instructional management all having multiple online specialities. The school gives credit for prior learning and accepts up to 90 credits for transfer, whether through degree programs, professional certifications or portfolios. The University has over 200 courses available online, all taught by UD campus faculty. Undergraduates who wish to pursue an Associate in Arts degree or RN to BS Nursing may do so online. UD Online has four graduate degrees that can be pursued completely online including Business Administration (MBA), Engineering, Electrical & Computer (MSECE), Nursing (MSN) and Teacher Leadership (M.Ed.). Two additional graduate degrees, Social Studies in World History (MA) and Economics and Entrepreneurship for Educators (M.A.E.E.E. ), are hybrid programs and require occasional on-campus meetings. UD Online uses Sakai as its primary course management system. Interested in distance education? Not sure what your choices are? 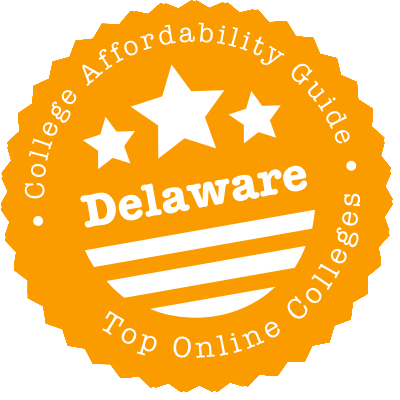 Check out our quick & easy guide to choosing an online program in Delaware. Here you’ll find links to online degree catalogs, discount tuition opportunities for Delaware residents, and info on online high schools and dual enrollment programs. We also take a look at online schools that have some significant quality concerns. A large number of southern schools, including the University of Delaware and Wilmington University, are part of the Southern Regional Education Board (SREB) Electronic Campus. You can use SREB’s handy online program & course catalog to search for any distance learning degree or course offered by a participating institution. The catalog even allows you to search by online programs, blended programs, or degree completer programs designed for adult learners. Programs that are marked “E” are offered at the Electronic Rate, which means the in-state and out-of-state tuition rates are the same. Thinking about earning an out-of-state online degree? If you’re lucky, you may only have to pay in-state tuition rates! SREB’s Academic Common Market-Electronic Campus (ACM-EC) was created to help students who are having difficulty finding certain degrees in their home state (e.g. Doctor of Nursing Practice). The ACM-EC list allows you to search for discounted online programs available to students living in Delaware. There are a few restrictions, however. Approved ACM-EC programs must be in one of the 15 participating SREB states. What’s more, you won’t be eligible for in-state tuition rates if a public college or university in Delaware already offers a degree program in your chosen field of study. To get started, you will need to meet admissions requirements of the college or university that offers the ACM-EC program and be certified as a resident of Delaware by an ACM coordinator. Visit the ACM-EC website for instructions. Because Delaware is such a small state, the Department of Education allows a number of out-of-state colleges & universities to confer degrees on Delaware residents. This list includes traditional public universities (e.g. Southern Illinois University), private non-profits (e.g. Nova Southeastern University), and for-profit institutions (e.g. University of Phoenix). SIU Carbondale has a variety of transfer agreements with Delaware Technical Community College (DTCC). Students who complete an associate’s degree at DTCC can finish their bachelor’s degree either at the Dover Air Force Base or online via SIU Carbondale. Peirce College—which has many online degrees—offers a modest scholarship to students who attend Peirce after earning a high school diploma or associate degree from one of its academic partners. These partners include schools like the Delaware Valley Charter High School and community colleges like Delaware County Community College (DCCC) and DTCC. Check with your out-of-state choice to see if it has any deals for Delaware students who wish to study online. Trying to take online college-level courses while you’re in high school? The University of Delaware (UD) Online has a High School Dual Enrollment program that allows qualified Delaware high school students to concurrently earn University of Delaware and high school credits. Students should register through their Delaware public high school. UD also allows high school students to complete distance learning courses (i.e. UD credit courses) as a Continuing Education (CEND) student. Students must make an appointment with an ACCESS advisor before they will be allowed to enroll in UD credit courses. Founded in 1997, the Delaware Center for Distance Adult Learning (DCDAL) helps Delaware residents earn their high school diploma or GED online. Diploma-At-A-Distance graduates receive their high school diploma from the James H. Groves Adult High School. As the title suggests, this high school is especially designed to allow adults to study while they meet family responsibilities and/or continue to work. To be judged “affordable,” an online school must meet our stringent criteria for quality, flexibility, price, and use of financial aid money. Schools that pass the test for two categories—”Most Affordable” and “Top Online”—have a CAG Score posted next to their profiles in our rankings. You’ll often see it on pages for other states. In 2018, no Delaware universities met our combined criteria. Online schools should be fully accredited by an organization recognized by the U.S. Department of Education. Stay away from any university that makes vague claims about international accreditation. Although national accreditation applies to for-profit distance learning institutions, regional accreditation is the gold standard for non-profit institutions (public or private). It’s also important if you’re thinking about transferring credits. The Middle States Commission on Higher Education (MSCHE) is the regional accrediting body for higher education institutions in the middle states (e.g. Delaware, Washington D.C., New York, etc.). You can use the Institution Directory to find community colleges and universities in Delaware. It even allows you to sort by a variety of classifications (e.g. Carnegie research activity, public vs. private, etc.). Heard unpleasant rumors about a school’s reputation? Have a look at MSCHE’s webpage on Non-Compliance Public Disclosure Statements. This will tell you if the school has recently been placed on warning, probation, or “show cause” status by MSCHE. MSCHE also announces when it’s decided to withdraw a school’s accreditation. The Council for Higher Education Accreditation (CHEA) Database is another useful source, since it lists both regional and national accreditations. Fortunately, unaccredited schools that used to operate in Delaware (e.g. Albert University, Trinity International University College, Washington American Governors University, etc.) have disappeared off the map. However, we discuss a few universities with issues below. ECU does not appear in the CHEA Database or College Scorecard and it holds no recognized national or regional accreditations. According to the Higher Education Degree Datacheck (HEDD), developed by the Higher Education Funding Council for England, it is also not a valid UK-degree awarding body. It claims to have accreditation from the American Association for Higher Education and Accreditation (AAHEA), which is not recognized by the U.S. Department of Education or CHEA. Middle States Commission on Higher Education (MSCHE): MSCHE provides regional accreditation for institutions in the middle states, including community colleges, public universities, and private universities. It’s easy to use the Institution Directory and the search function to find regionally accredited schools in Delaware. The MSCHE also lists each school’s Carnegie Classification in its summary. Delaware Center for Distance Adult Learning (DCDAL): DCDAL was especially created to help Delaware residents earn their online high school diploma or GED. Diploma-At-A-Distance graduates receive their high school diploma from the James H. Groves Adult High School. University of Delaware (UD) Online High School Dual Enrollment: This distance learning program gives Delaware high school students the chance to earn University of Delaware and high school credits at the same time. Online courses are taught by UD faculty. Students should register through their Delaware public high school. Southern Regional Education Board (SREB) Electronic Campus: SREB makes it simple to search for online degree programs or courses being offered by participating institutions throughout the southern states, including Delaware. You’ll also find plenty of answers to FAQs, info about transferring credits, a section on financial aid, and a list of online programs that qualify for in-state tuition benefits.